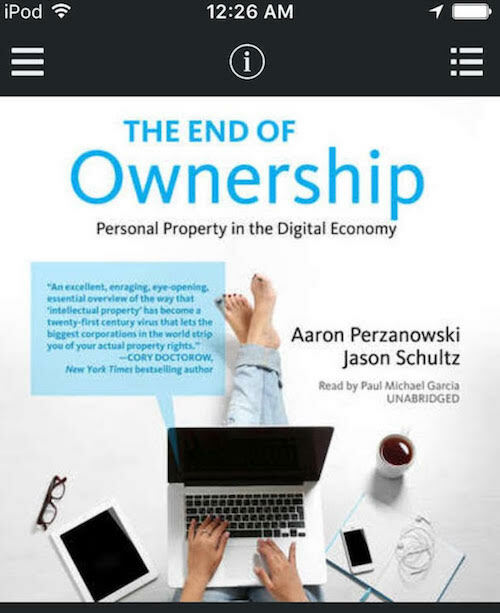 In THE END OF OWNERSHIP by Aaron Perzanowski (Case Western law professor) and Jason Schultz (an NYU law professor) discuss the legal and social issues surrounding downloading audiobooks, songs, movies, and games. DRM or Digital Rights Management is a tool used by authors and publishers to control the sharing of intellectual property, which has impacted the entire entertainment industry. 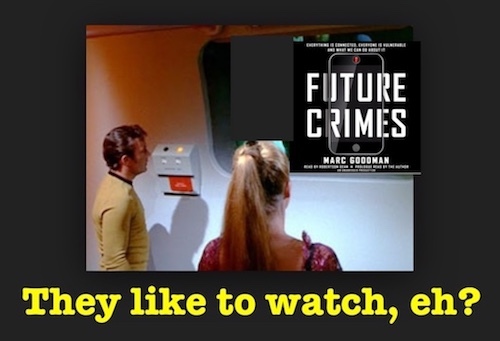 (Joe Walsh, the “Analog Man” once talked about this: “The music industry is done.”) When you purchase a print book or vinyl record, you own it, and can resell it, lend it, or burn it to keep warm (Fahrenheit 451.) 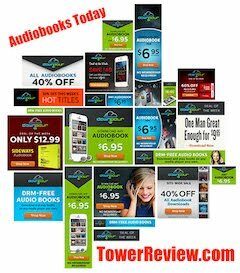 Even with a digital download you “own” the book or song on your device, and have limited options for sharing (usually one time.) But now there is streaming from the Cloud, so your access is “Up in the Air.” (That’s also an audiobook and movie starring George Clooney involving firing people.) They limit and can erase your access at any time. Which makes sense for them, since the aftermarket is curtailed, and piracy avoided. CDs are going away, just like cassettes did. Apple iTunes keeps strict control of content and limits access because they are a hardware company. (A reversal of this is when a printer CEO once said, “We’re not in the printer business, we’re in the INK business.”) You don’t “own” anything in the Cloud, you are leasing. When the lease runs out, they can delete it from your device. So now you know why “they” are pushing “the Cloud” so heavily. Will Apple soon require Cloud computing on all devices? The profits will be staggering once everything is in the Cloud, and CDs are history. Like Facebook, both Apple and Amazon are battling for billions for even Pentagon contracts. Indies like Downpour and Kobo work hard for a tiny share, by comparison, and do not track you. Meanwhile, Facebook spies on users and sells their info to third parties, who may then be hacked. (Listen to Future Crimes for horror stories related to this.) Even so-called “free” games come with hidden dangers, so be sure to read your Terms of Service, particularly at the end of thirty pages of tiny print. (So much easier to just click the big red “Accept” button.) If you like games, how about a game based “audio” movie instead? 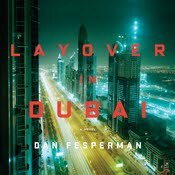 The authors of this audiobook, subtitled “Personal Property in the Digital Economy” argue that technology should be a tool to aid people, for “self direction and autonomy,” with privacy and transparency critical. Which is also what Jaron Lanier, the father of Virtual Reality, also says. Narrated with skillful engagement by Paul Michael Garcia for iPhone, iPod Touch, or Android devices. (Which you can also connect to your car stereo instead of texting yourself into a traffic accident!) As Eckhart Tolle would put it, “The present moment is all you will ever own.” The alternative is this.